The Acting Chairman of the Independent Corrupt Practices and Other Related Offences Commission (ICPC) Dr. Musa Usman Abubakar stated this recently at the inauguration of ACTU members of the Nigerian Meteorological Agency (NIMET) in Abuja. Dr. Abubakar, who was represented by Mr. Justin Kuatsea of the Corruption Monitoring and Evaluation Department of ICPC encouraged the new members to work hard and endeavour to stay on the path of integrity by ensuring that they lived up to the expectations and trust reposed in them for the assignment. Earlier, the Director-General of NIMET, Prof. Abubakar Sani Mashi referred to ACTU as a vital tool within MDAs, to assist ICPC and the entire nation in the fight against corruption and culture of impunity. Prof. Mashi urged the members to discharge their duties without bias while displaying high levels of integrity in the performance of their duties. He assured them of management support to achieve their mandate of preventing corruption in NIMET. 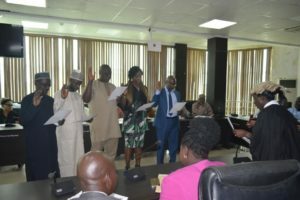 In his remarks, the new Chairman of NIMET ACTU, Mujitaba Ajikolo promised to discharge their duties as specified in the Standing Order for the operation of ACTUs. Ajikolo also charged his colleagues to perform their duties with high sense of responsibility, integrity and dedication.